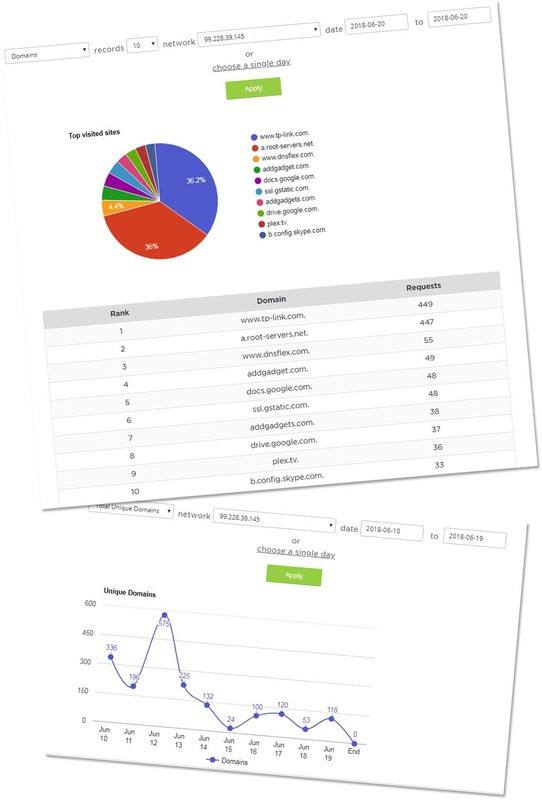 With DNSFlex Statistics, monitor and track your internet usage at home with real time data reporting. Feel safe knowing what websites are being accessed in your home. Data viewing options are available per day or range of dates within a 2 month retention period. 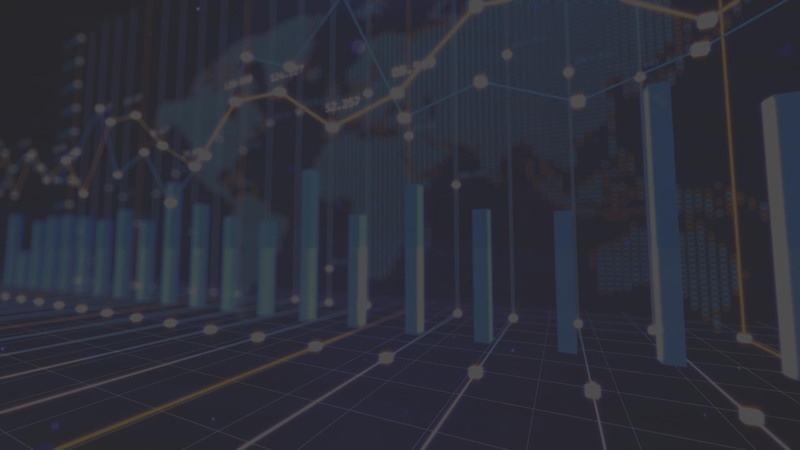 DNSFlex has the ability to create a report based on the DNS Query data captured within your Network organisation whenever someone using DNSFlex DNS servers accesses the internet. When end users on the network navigate to the internet, they generate hostname lookup queries to the DNS server, these query types vary by type. 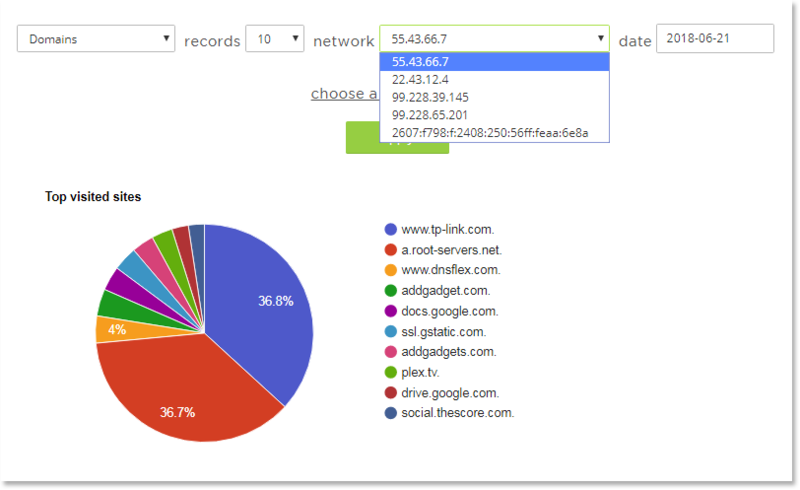 DNSFlex allows network administrators to generate reports based on the following DNS lookup data. Domain names (http/https) accessed within a specified time period with total number of requests, sorted by highest number. Displayed on a linear graph, includes an aggregate number of total domain names accessed within a predefined time period. DNS Type queries can be either A, AAAA, PTR, MX or SOA. Each request type will be displayed with the corresponding number of requests. Total number of DNS Type queries (A, AAAA, PTR, MX or SOA) aggregated and displayed on a linear graph. Choose between time range or single day. Displays unique domains that match your blocked domain filter list, that have attempted to be accessed including number of access requests. Configure statistics collection for up to 5 networks. View historical data for all your networks, instantly! Our analytics engine supports both IPv4 and IPv6 so you’re never left in the dark. Sign up now with DNSFlex to get the full online experience.